Landon Zinda currently serves as Deputy Legislative Director to Representative Tom Emmer (R-MN), handling technology, telecommunications, judiciary, and other issues, including Congressman Emmer's FinTech work on the House Financial Services Committee. He is also responsible for Congressman Emmer’s work on the Congressional Blockchain Caucus. 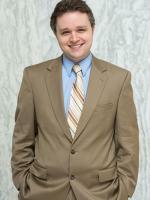 Previously, Landon worked at the Heritage Foundation's government affairs department until 2014. Landon is a graduate of American University Washington College of Law and Gustavus Adolphus College.